Experts agree that the vast majority of us are chugging along at approximately one percent of our mental capacity. Super-charge your thinking and learning abilities by discovering the latest about the brain and its potential, and how you can prod this "sleeping giant" into undreamed-of action. Make the Most of Your Mind will give your intellect a thorough, energetic, and truly enjoyable workout. You'll find challenging self-improvement exercises, self-checks, and unbeatable techniques for sharpening every facet of thinking, learning, and communicating. Discover how to store and summon information from your memory, put your reading abilities on "high-power," use the fine art of listening and seeing, hone your numerical skills, give the creativity of your mind a boost, and improve your logical and analytical powers. This audio seems to have been recorded in about 1960. I interpreted a memory class in 1975, and it had more helpful information in it than this program did. The highlights? Attach an image to a feature on a person's face, and read faster by running a pencil tip under the words in your book. I don't think so. A glance at the bookstore shelves tells me that this author is a 1-trick pony getting a lot of mileage for a little material! If you're a complete novice to maximizing study potential, then this isn't a bad choice. On the other hand, a lot, if not all, of the material is covered in any basic study skills course. I didn't feel it was worth the $. A great read for anyone needing obvious tips and hints, without all of that annoying in depth discussion. This book skims the surface of a number of no-brainer subjects, and is as in-depth as a USA Today article. Not enough bang for my buck. I did read other reviews on this audible but didn't head them which is my mistake. I would have rather spent the cost of this to go see a matinee even though my main focus right now is bettering my memory and learning capabilities. This seems like it is trying to be an incognito hook for other materials from the same author. If this was advertised as a primer (and not a "a thorough, energetic, and truly enjoyable workout.") 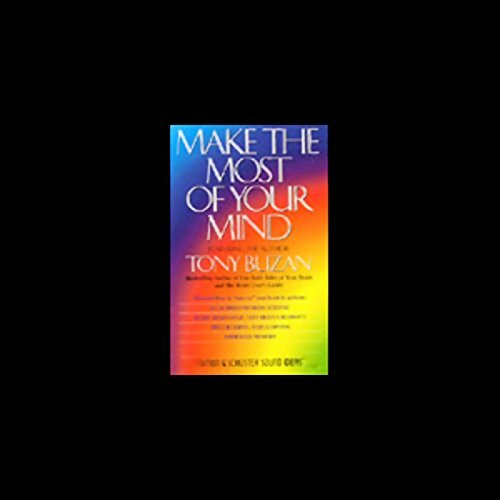 or as giving an ultra-light introduction to making the most of one's mind, I may have considered purchasing other media from Mr. Buzan. Instead I see him as a used car salesman of education by sneaking a lemon into my library. I've followed Tony's method for quite some time. It is a valuable tool in collecting and organising material. This Audiobook doesn't add anything for me, although it is a helpful introduction to the method for those who aren't familiar. 17 sur 24 personne(s) ont trouvé cet avis utile.